With a lot of rustling in the area, tensions are high and rumors are flying fast and furious. Word’s going around that some of the larger ranchers have hired a gunman named Wolf Carlton to stop the rustling and protect their cattle. And now a couple of the smaller ranchers have been found shot to death. Unfortunately for Spencer Prescott, some of the rumors are now about him. Some people think Spencer’s the one killing the competition, not Wolf. Even worse, some folks think Spencer is behind the rustling—and that means trigger-happy Wolf will be looking to put a bullet in his back. At first this book comes across as slow moving, but as you read on you become aware that this story is more a character study than an action filled western, a story that is driven by dialogue. John D. Nesbitt takes his time introducing you to the many fascinating people that this tale revolves around, and it’s during this time that he plants the seeds of suspicion on various characters. A fair amount of the story features horses and this adds to the overall entertainment this book provides. It doesn’t take long for Spencer Prescott to begin to suspect who’s behind the unexplained killings that happen at regular intervals. Problem is he can’t prove anything and soon finds himself being set up as the killer, but by whom? So the book also combines strong elements of mystery to the more traditional plot of rustling. 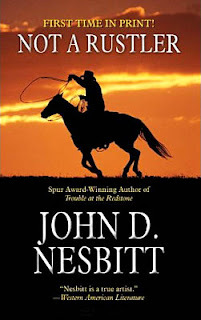 John D. Nesbitt’s writing style is extremely readable, and the almost gentle opening to the tale proves to be a slow burning fuse that inevitably picks up speed before exploding in violence that ties all the story threads up neatly. When Billy Clanton and his friends are murdered in Tombstone by the town marshal and his deputies, the growing tension between the local authorities and the ranchers spirals out of control. The once sleepy frontier town is mired in hatred, with bad blood and scores to settle on both sides. Families are torn asunder as the violence rages on. Will there ever be peace in Tombstone? Or will peace only come when one side reigns victorious? It’s not often that I’ve read a Black Horse Western that tells the story of real events. Yes some use them as background or as a small part in a mostly fictional tale, but this one is different, no fictional hero, just people who really lived. The book begins just after the shootout at the O.K. Corral – in fact these events are recalled latter in the story, covering just a couple of paragraphs. Ralph Hayes relates the continuing feud between the Earp’s and Ike Clanton. After the killing of Morgan Earp, both sides are seeking revenge. Ralph Hayes writes a superbly paced story in which he builds tension through a number of face-offs between the Earp’s and Clanton. He also doesn’t try to paint any of them as heroes. His portrayal of Doc Holliday shows him to be a vicious cold-hearted killer with a short temper. In fact John Ringo comes across as a more likeable charact er. For those who enjoy reading about Wyatt Earp and Doc Holliday this book is a must read. For those who enjoy a well-told story that follows true events, I can do nothing but recommend this to you. I believe this is Ralph Hayes first Black Horse Western and I hope it isn’t his last. 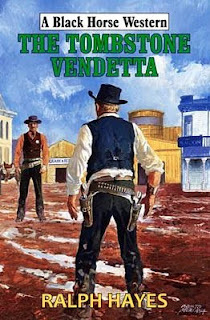 The Tombstone Vendetta is officially published on February 26th, but should be available now from the usually sources. The second book to feature Jake Silver has had its publishing date brought forward due to demand, and like the first book, Saving Tom Black, this proves to be an excellent read too. Jere D. James has a wonderful talent of making the reader care about the people he writes about, even those who could be seen as the bad guys. The story’s main character is a woman, Sophy. 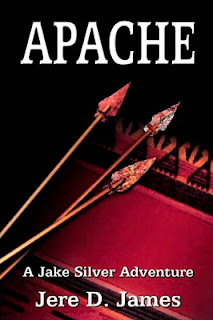 A woman with a heartbreaking past that sees her living with an evil man, a man she is saved from by an Apache. It is the relationship between Sophy and Nantan Lupan, the growing love between them, that brings forth the books main message of racial prejudice and hypocrisy, the latter something Jake Silver will battle with as he fights to end this relationship before it goes too far, and if that means having to kill the Apache to do so then so be it, even if this also risks destroying his own bond with his sister Sophy. Having Jake Silver’s sister in the story allows Jere D. James to fill in more about Silver’s past, tell a little about his childhood and parents. As Silver attempts to return his sister to civilization he will find himself struggling with doubts about his own relationship with Bet sy, his growing feelings of being trapped giving rise to an anger that will see him picking fights. When the Apache kidnaps Sophy – the only way Natan Lupan belives he can be with the woman – Silver finds himself on a deadly hunt in the desert. Jere D. James packs this tale with exciting and gripping situations that grab the readers attention from the word go, making the book very difficult to put down before the end. And even as the tale comes to a close Jere D. James has one more surprise to spring, one that will have the reader very eager for the next book in the series, Canyon of Death, to be published, something that in my opinion can’t come fast enough! Gentleman Jim Murphy was content to play high stakes poker until he heard about the gold; Billy wanted to avoid his former confederate, tough ex-Union Sergeant Joshua O’Donnell; Seraphim Angel McCall wanted all she could get; and nobody trusted anybody. Not the best of starts when the four banded together to form an unlikely partnership to search for the long lost Confederate bullion, especially since they were up against the redoubtable Zachariah Holmes and his murderous band of Comancheros. The trail began in Madison and led into the trackless wastes of the hostile, sun-blasted desert, where the intrigue redoubled with treacherous plots and counter plots flying as fast as the bullets. The gold may have been there, but would anybody live to retrieve it? Robert Anderson is a new author to me, although he has had a number of Black Horse Westerns published before this one. His writing is simple and straightforward making for a fast flowing and easy read. With this book he spends quite a lot of time bringing the four main characters together and telling their back-stories, which also explains how the gold got to be hidden. There’s not as many twists as the blurb indicates there might be, but there are a few, a couple of which I didn’t see coming, particularly the last one that concerns the fate of the gold. I’d have liked to of seen a little more made of the mistrusts between Jim, Billy, Josh, and Sera, I think this could have created more tension to the plot. There’s plenty of action with a prolonged and exciting final showdown that is very well written and very visual. 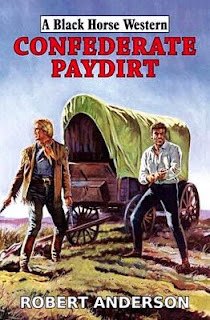 Confederate Paydirt has an official release date of February 26th but should be available now from the usual sources. To survive, Fargo has hunted just about everything under the sun. Now he’s been hired to take part in a twisted contest of predator and prey that will determine which of the Clyborns will inherit their late father’s fortune. And the Trailsman knows too well that sometimes the hunter can become the hunted…and that the hunted can become the dead. A story about greed and hate, filled with fascinating characters such as the Clyborn family and the brother and sister assassin team – the woman’s fighting abilities making her a formidable foe for Fargo. For those who like their westerns filled with action then you need look no further than this book, there’s plenty of it, mainly fist and knife fights, all being extremely well described. There are also many twists and turns to the plot as Fargo attempts to discover just who hired the assassins and why. This leads to some surprising revelations about some of characters, a couple of who aren’t above double-crossing the others. Jon Sharpe (in this case David Robbins) writes a fast flowing, gripping, story. From the very first attempt on Fargo’s life on a riverboat to the deadly race to find the fortune and stay alive, this book proves to be very difficult to put down. 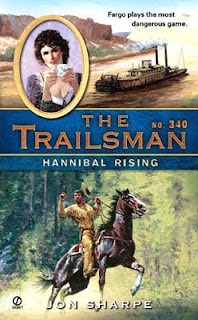 For those who don’t mind books that include adult encounters – here just a couple that don’t take up much of the story – then I highly recommend this entry into The Trailsman series. The dark clouds are gathering, and it’s promising to be a doozy of a storm at the River Bend stage station…where the owners are anxiously awaiting the return of their missing daughter. Where a young cowboy hopes to find safety from the rancher whose wife he’s run away with. Where a Pinkerton agent has tracked the quarry he’s been chasing for years. Thunder won’t be the only thing exploding along CRUCIFIXION RIVER. The title story in this book is written in the first person, in fact told from the viewpoint of many people, each short chapter being titled by the name of the character who’s thoughts the reader will share. This is just one of the things that makes this story extremely memorable. 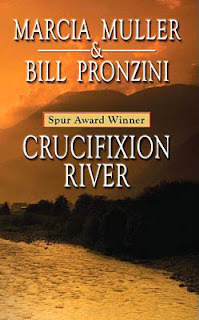 Crucifixion River brings together a fascinating bunch of people, a number of whom aren’t satisfied with the lives, those that hide secret pasts, those who are running away, and those who aren’t ready to reveal who they really are before the time is right. Due to this many of these characters soon become suspicious of, and have doubts about, the people they find themselves with. After a sudden burst of violence the opportunity for robbery arises too. This all leads to a well told, and exciting, climax. After this terrific western tale come a number of other short stories, and here Leisure have crossed genres, all the others falling under the mystery banner. All these stories having been published elsewhere such as in Ellery Queen’s Mystery Magazine *. All the st ories are well-written, gripping, tales. Twists and turns abound. Characters are well drawn and will stick in the mind for a long time. My favourite being Free Durt. The idea of mixing both western and mystery fiction in one book works well and makes this a must read for those who enjoy both genres. And for those whose preferred reading material is westerns, the strength of the title story should have you hunting this book out, and who knows after reading the mystery tales you may become a fan of that genre too – and vice-versa. This book was published at the end of January so should be available now. Bill Pronzini and Marcia Muller are a husband-wife writing team with numerous individual honors, including the Lifetime Achievement Award from the Private Eye Writers of America, the Grand Master Award from Mystery Writers of America, and the American Mystery Award. In addition to the Spur Award–winning title novella, this volume also contains stories featuring Bill Pronzini’s famous “Nameless Detective” and Marcia Muller’s highly popular Sharon McCone investigator. A cloud of suspicion and anger lies over the dusty little cattle-town of Bridger’s Wells, for the herds are being systematically pillaged by elusive thieves who manage to spirit the animals away over the high sierra. In the saloons and streets of the town dark speculations abound and tempers are on a hair-trigger when what appears to be an act of murder touches them off. The cattlemen decide upon rough justice and set out to round up the outlaws. Legal niceties, proper proof, pity – none of these counts for anything anymore. Walter Van Tilburg Clark has written a book that challenges both views on the legalities of lynch-law, can a posse be judge and jury or should the accused men be taken to stand before an official judge? There is a lot of dialogue as the characters try to convince each other which way their decisions should sway. Another thread of the story sees this argument used to decide whether someone is a man or a coward. The book is filled with colourful characters, and no-one person stands out as being the hero. All go through many emotional changes and question their own deeds and beliefs as the incident of the title is played out and how it effects them afterwards, for some these events will prove to be to much to bear. This isn’t a book filled with shoot-outs and action. It’s a psychological study in human nature that is beautifully portrayed. A story that will make you think. I did fell the book could have been shorter, as the author spent a lot of time describing everything in minute detail, such as the painting hanging above the bar, the clothes the characters wear, the lines of age on their skin. I’m not sure the love / jealousy parts of the book were needed either – and the stagecoach scene that supports this thread of the tale – unless this was just a way to involve a woman in the story, but this is probably down to personal taste. Having said all that I did enjoy the book and can see why it is held is such high esteem. 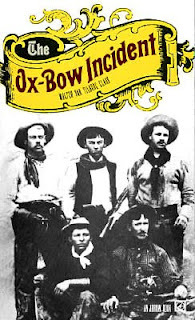 After finishing the book it just seemed natural for me to delve into my movie collection and dig out the film version of The Ox-Bow Incident. The film came out three years after the book and didn’t seem to deviate from the book that much until the end and perfectly captured the bleak and psychological elements of the story. It’s a short film, clocking in at 75 minutes, and probably due to it’s length seems to move forward faster than the book, even if it does contain the scenes involving the stagecoach and the love interest – again I felt these could have been missed from the film without compromising the effectiveness of the story. So what differences are there between book and film? The major elements are that the film doesn’t include all the effects the hangings have on the members of the lynch party, and sees a change in how many commit suicide at the end. The other big alteration was that the contents of the letter written by one of the accused men isn’t made known in the book, although it does play an important part. In the film this letter is read out at the end, shamelessly playing for a sentimental ending that fills the posse members full of guilt that does provide a powerful finish to the film. If you’ve never seen the film, or read the book, then I’d suggest you consider doing so, as I doubt you’ll be disappointed in either. 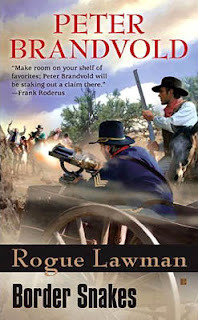 Peter Brandvold begins the fifth book in the Rogue Lawman series with Hawk taking on a gang of outlaws in an exciting, and bloody, gunfight. This sets the scene for the rest of the story, with Hawk up against massive odds, which seem almost impossible for him to win against. As expected the violence is bloody and graphic, and there’s loads of it. Hawk finds himself teaming up with Sergeant Ironside and a person from his past (see previous books in the series). These three find themselves taking on Monjosa and his army of killers in a tremendous battle in which a Gatling gun is used to devastating effect. Not only does Peter Brandvold have his hero facing death many times, Hawk will also have to deal with treachery and double-cross that will leave his soul scarred. This book has to be recommended to those who enjoy the more brutal types of westerns, those filled with tough characters who take another’s life without a second thought or concern for their own. Me? I’m eagerly awaiting the next book in the series.